Aloo gobi is one of the most popular combo in north indian kitchen and every house hold has there own favorite recipe. This recipe is inspired by vah chef at vah reh vah.com . I tried this because this recipe reminded me of friend and childhood picnics and must say it really perfect for party. Deep fry potatoes and cauliflower and keep aside. Heat oil and add asafoetida and onion. Cook till onion turns light golden. Add turmeric , coriander , chili and cumin powder. Cook for 30 sec and add the tomato. Cook till tomato is well mashed and oil starts to separate. Add the fried vegetables ,kasuri methi and garam masala . Add 1/4 cup hot water and mix everything well . Simmer everything for 2 minutes . Garnish with coriander leaves and you are ready to serve. Deep fried version always taste amazing,very tempting gravy..
wow... this looks delicious... mouth watering..
Luv the nice colour of the delish dish. 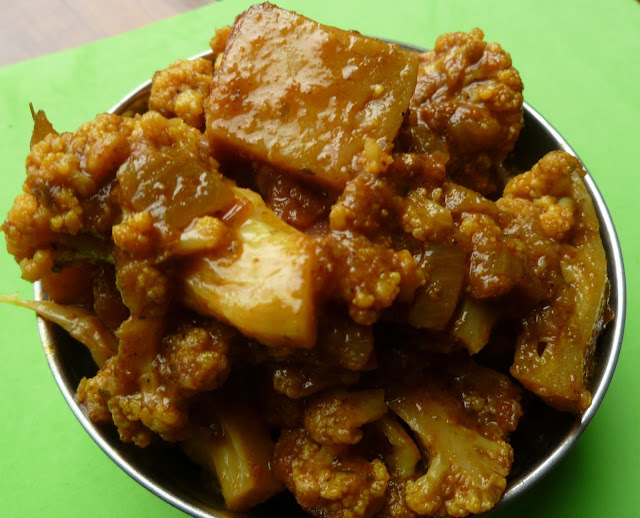 Very flavorful and inviting aloo-gobi. Thanks for visiting my space and leaving your lovely words there. Glad to follow you back. Keep in touch.